Sometimes the small dogs ride in the sled. The exact location of your tour will be discussed at the time of booking. 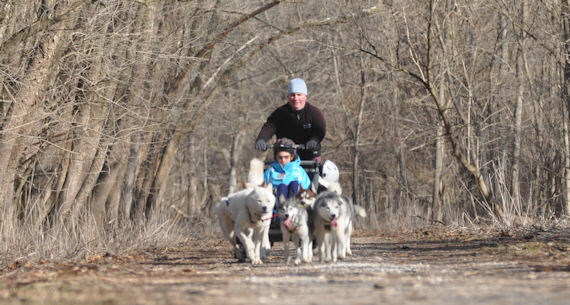 All of our dog sledding programs and tours take place along the scenic Torrey C. Brown Rail Trail (formerly known as the Northern Central Rail or NCR trail) in Northern Baltimore County, Maryland. The exact location and exact start time of your dog sledding program along with detailed driving directions will be emailed to you approximately one week before your program. This location may be changed by Maryland Sled Dog Adventures LLC due to unsafe or over-crowded trail conditions at a specific location. If this occurs, we will contact you as soon as possible. Most of our trail heads do not have physical addresses for use with GPS, Mapquest, or Google Maps. If you would like to get an idea of drive time, map to Monkton, Maryland. A map of the Torrey C. Brown trail along with basic driving directions can be found here, however, please refer to your start time and trail head email for detailed driving directions. These are the directions you should follow the morning of your dog sledding program. Your exact trail head will be within 10 minutes of Monkton. Please see Start Times below for additional information on how we choose your trail head and exact start time. 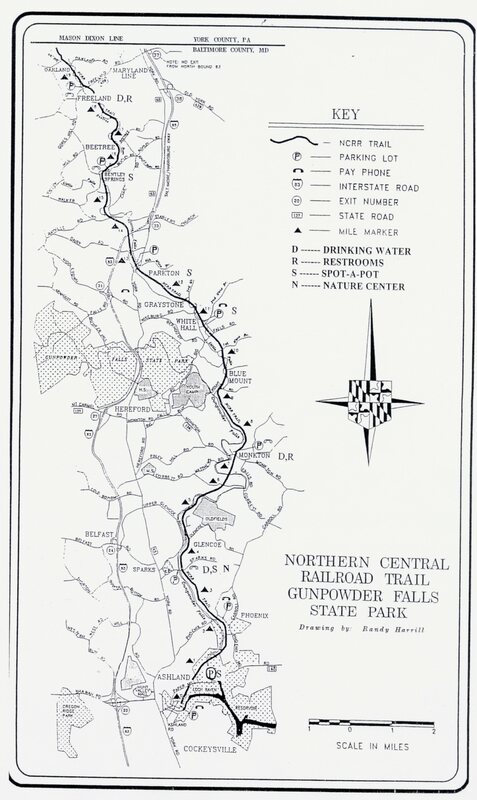 A map for the trail is available along with information on the trail. All of our dog sledding programs are morning programs. Group programs begin at 8:00 AM, 9:00 AM, or 10:00 AM. Individual programs (Yappy Hours and Tours) may begin as early as 7:00 AM to get the best temperatures possible for the dogs to run in. The exact location and exact start time along the Torrey C. Brown Rail Trail will be chosen approximately one week before the date of your dog sledding program. This information, along with specific driving directions, will be provided to you via email. This allows Maryland Sled Dog Adventures LLC staff to evaluate the weather forecast prior to selecting the start time and location for your dog sledding program. Start times are selected for the dogs' benefit in order to obtain the best (i.e. coldest) temperatures reasonably possible. If temperatures are forecast to rise to 40 degrees or above, we will need to begin your program earlier, 7 to 8 AM. If temperatures are going to remain in the 30s or below through out the day, we may be able to begin your dog sledding program between 9 to 10 am. Exact trail locations are selected taking into account trail conditions and trail congestion. Unfortunately, due to variability in the weather, trail congestion, and trail conditions, requests for a specific time slot or trail head cannot be accommodated. All tours and programs are by reservation only. To reserve any of our programs, please call us at (443) 562-5736 or email us at catherine@marylanddogsledding.com. The following policies apply to our Maryland dog sledding programs. For payment and cancellation policies for our Maine dog sledding programs including our Maine Winter Cabin Adventure, please visit our Maine Winter Cabin Adventure website. Pricing is subject to change but will be confirmed at the time of booking. A fuel surcharge may be applied to programs held at specific locations. All reservations require a deposit in the amount of fifty percent (50%) of the total program cost. Group program deposits for our Scout Patch Program and Educational Dog Sledding Program are done based on our minimum of fourteen (14) Scouts / children. This deposit is due at the time of booking. If the deposit is not paid within seven (7) business days of the date of booking, Maryland Sled Dog Adventures LLC reserves the right to cancel your reservation. Maryland Sled Dog Adventures LLC accepts cash, travelers’ checks, personal checks, and money orders. Girl Scout and Boy Scout troop checks are acceptable. All deposit checks for our dog sledding programs should be made payable to "Maryland Sled Dog Adventures LLC." Group programs should be paid using one check for the deposit and one check for the balance. Thank you in advance for your cooperation. Maryland Sled Dog Adventures LLC reserves the right to cancel or reschedule any program or tour due to dangerous weather or trail conditions. If we cancel, cancellation charges do not apply. We /will contact you as soon as possible if any of these conditions exist. If you cancel less than twenty-one (21) days in advance, your deposit is forfeited. For cancellations made more than twenty-one (21) days in advance, deposits are refunded less a fifty dollar ($50) processing fee. Group reservations require a deposit in the amount of fifty percent (50%) of the total program cost. No shows are charged the full program cost. All requests to reschedule are treated as cancellations and are subject to the above-referenced policies. Inclement weather and being outdoors in it is part of dog sledding and is to be expected. Here at Maryland Sled Dog Adventures LLC, our policy is that we run rain, shine, sleet, or snow. Please do not book a dog sledding program if you or the parents in your group are not prepared to drive in any weather including but not limited to, snow and ice. While we do not often have snow on our trails, we are a dog sledding business and snow is to be anticipated and enjoyed. We do not cancel for snow. If you cancel with less than twenty-one (21) days notice for any reason including snowy travel conditions, your deposit is forfeited. For groups, your final head count is due 72 hours in advance of your program date. Please notify us at or before 72 hours prior to your program with the final number of participants. Should the group's numbers decrease within 72 hours of the program date, canceling individuals will be charged the full program cost. Increase of numbers is at the discretion and ability of Maryland Sled Dog Adventures LLC. We arrive at the trail head early to begin your dog sledding program. We expect you to arrive on time as well. A grace time of ten minutes will be allowed. For parties arriving later, we reserve the right to eliminate or shorten elements, including the ride, of your dog sledding program. Parties arriving 30 minutes or more late, will be considered no shows and will be subject to our cancellation policies listed above. Groups should plan on arriving five to ten minutes before their set start time to allow participants plenty of time to put on their heavy winter clothing and use the rest room / porta potty if necessary. We thank you in advance for your cooperation. Gift certificates are available for individual programs. Gift certificates are not refundable, not transferable and are subject to availability. Because we are a small mushing kennel, weight restrictions do apply. Weight restrictions vary a bit based on temperatures, length of run, rig vs. sled, etc. but in general we can take one adult or one child at a time and we are limited to passengers that are 200 lbs or less. All participants must sign our Waiver and Release before beginning any program. A Waiver and Release must be signed by the parent or legal guardian of each person under the age of eighteen. Please note: If you are an adult accompanying a minor who is not your child, his/her parent or legal guardian must sign our Waiver and Release and you must bring it with you the day of the activity. You will not be allowed to sign on behalf of minor participants who are not your children or legal wards. When completing our Waiver and Release for a minor, please complete and sign both the second and third pages. Individuals without a completed Waiver and Release will not be allowed to participate. Should you have any other questions, please check out our FAQ page or email or call us.